We look forward to working with your troop on transformative arts and learning experiences to help build girls of courage, confidence and character, who make the world a better place! Brownies and Juniors are invited to join us for an overnight camp experience. Located on 115 acres of beautiful fields and woods, Appel Farm is an idyllic (and ideal!) spot for girls to spend time connecting, sharing and learning. 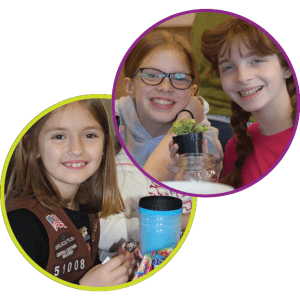 Our engaging curriculum is designed to teach girls about science, the environment and social issues through workshops in the visual and performing arts and to help Girl Scouts earn up to 5 badges. Girls have the opportunity to meet other girls from around the tri-state region in a supportive and safe environment that fosters community, personal growth and critical thinking. Stay for 1 night and earn 2 badges. Stay for 2 nights and earn 5 badges! Scouts who stay for 2 nights also earn an Appel Farm Artist Badge! Friday night is sold out! Register for Saturday night, or join us on either day with a Day Pass for Scouts $35, Chaperones $10. Register by 3/1 to save $5 on each 1-Night Scout! Register by 3/1 to save $10 on each 2-Night Scout! Our Chaperone/Girl Ratio is 1:6 for Brownies and 1:8 for Juniors. Please register an adult chaperone for every 6-8 girls. All inclusive price includes accommodations, delicious and healthy meals and snacks, workshop supplies, and badges. Register online here with a non-refundable $105 registration deposit to reserve spots for your estimated number of girls and chaperones. We will contact you via email to confirm your numbers on March 22, and your balance will be due by April 5, 2019. You can always email us at [email protected] or call us at 856-358-2472 or with questions, to register, or to make payments over the phone. Our goals for the girls are based on the 6 Cs of Positive Youth Development. Our over-arching goal for Crafty Campout is to create a supportive and safe environment that fosters community and personal growth as scouts explore their creativity, learn new artistic skills, and earn badges by which they remember the adventure and show the world what they’ve accomplished (Contribution).